Arbitrarily, perhaps, I am defining a serial as a work published in three or more consecutive issues of the same periodical. Of the magazines in which these works appeared, only CHILD LIFE is still being published, and copies of the old issues rarely appear for sale. Some of the magazines can be found as bound annuals on the shelves of libraries, but others cannot. The bound periodicals are not available through interlibrary loans, and it is usually necessary to go to the library in question to read the serial. Visitors to a library may have to provide a request in advance or wait for hours while dusty volumes are retrieved from remote storage areas. As a result, I have not attempted to find and read most of the serials that appeared independently as books, and these are listed without a description of their contents. The serials are listed in chronological order. Adventures in Candle Street. Illus. by Reginald Birch. CHILD LIFE, XVI (1): pp 6-9, 28, 30; (2): pp 66-67, 94-96; (3): pp 116-118, 128, 140; (4): pp 158-160, 181; (5): pp 206-210; 225; (6): pp 258-260, 272-273. January-June 1937. Marjorie Barrows, Editor. Rand McNally & Company, publisher. Chicago. Adventures in Candle Street was published, 1937, by Longmans, Green and Co. as Moonshine in Candle Street. The text of the book has been edited to adapt to the needs of the magazine, typically by the omission of descriptive matter. The outstanding illustrations show to their best advantage on the larger magazine pages. Old issues of CHILD LIFE are frequently offered for sale by eBay on the Internet. Miss Barrows, Editor of CHILD LIFE (U.S.A.) has accepted Moonshine in Candle Street. It is to be cut to comply with their requirements for serialization. I do not like this. The Silver Whistle. Illus. by Raymond Sheppard. WOMAN'S MAGAZINE, 61(8); (9); (10); (11): pp 13-16, 52, 57; (12); 62(1); (2); (3); (4): pp 44-47, 76; (5). May 1940 - Apr. 1941. Published at 4 Bouverie-street, London E.C.4. Republished in U.S. as Silver Whistle. Illus. by Kreigh Collins. CLASSMATE, LIV(5): pp 1-2, 6, 10, 15; (6): pp 4-6; (7): pp 4-7; (8): pp 4-6; (9): pp 4-6; (10): pp 4-6; (11): pp 4-6; (12): pp 4-5, 10; (13): pp 4-6; (14): pp 4-6; (15): pp 4-6; (16): pp 4-6; (17): pp 4-7. Feb. 2 - Apr. 27, 1947. C.A. Bowen, Editor. The Methodist Publishing House, 810 Broadway, Nashville 2, Tennessee. Two of the three issues of WOMAN'S MAGAZINE that I own with chapters from this serial owe their survival to their wartime covers, which feature pictures of Princesses Margaret Rose and Elizabeth. 'The Editor' is not named, nor are there any volume or issue numbers. I infer that the first issue, May 1940, is 61(8), because the first page of a bound copy of the 1937 annual identifies the October issue as 59(1). The Bouverie-street address is also that of the Lutterworth Press and a number of other publications. I am indebted to Agneta Thomson for sending on to me the photocopies of the serial that she received from Savery. CLASSMATE was distributed weekly by The Methodist Church to Sunday School classes. Although issues of the magazine are not often available for purchase, they are shelved in archives at Emory and Drew Universities, among other places. Given that the serial in CLASSMATE followed the publication in WOMAN'S MAGAZINE, it is not surprising that the former serial has been edited, American spelling adopted, and the text somewhat condensed from the original. The work diaries do not indicate that Savery did the editing, and I think it unlikely. This is another Savery story about the Huguenots. Seventeen-year-old Gilles de Courtenay has been led by his stepsister, Fern, into rebellion against his strict stepfather, Ivo Kinglake and has gone so far as to become Secretary of the Junior Philosophers, a group of young men who praise Voltaire and Rousseau while criticizing the established Catholic Church. While Gilles has understood little of their discussions and confined his activity to drinking wine, dozing through debates, and writing minutes, he is in literal danger of losing his life as a Huguenot revolutionary. Furthermore, he screens Fern from her role in his disobedience and allows his stepfather to believe it was he, not Fern, who wrote a disrespectful diatribe against Ivo's role as head of the family. After taking immediate steps to shield Gilles from the consequences of his philosophical inquiries, Ivo declares that he has failed in his duty to raise his stepson properly and will return to his own estates in Cornwall, leaving Gilles and Fern behind. His only concession is to send for his dissolute brother M. Andre to act as the children's mentor because of the difficulty of finding a more suitable tutor who is also a Huguenot. When M. Andre arrives, he is more dashing than dissolute and soon wins the approval and friendship of Fern and Gilles. Unfortunately, Gilles has promised not to betray Fern, and Fern cannot bring herself to write a confession to her father, although it is not long before M. Andre learns the truth. When Gilles is arrested for revolutionary behavior, Ivo returns to France long enough to provide an alibi and to assist in Gilles' release from prison, but then returns, as icy as ever, to Cornwall. At this time, Gilles' unscrupulous, but influential Tante Attilie informs the incredulous Gilles that M. Andre is to be arrested as a 'salt-smuggler' and enemy of the regime. However, she promises to avert his arrest and arrange for him to flee the country if Gilles will relinquish his hereditary rights to the Courtenay estate in favor of l'Oncle Hugues, Tante Attilie's husband. Left with no alternative, Gilles makes the necessary affirmation and leaves France for Cornwall, taking Fern with him. Despite this tangled skein, Savery produces a couple surprises that bring the story to an entirely satisfactory conclusion. Readers of The Boy from Brittany will find that Gilles and Fern do marry, an outcome that will surprise no one. Blue Fields. YOU AND I, 22 (#253 - #264). Nov. 1940 - Oct. 1941. Blue Fields was published, 1947, by Victory Press as a book. I have not seen the serial. The volume and issue numbers above were extrapolated from those of Rainbow Castle, below, and it may be that the publisher's address is the same. The British Library is the only archive listed by COPAC with old issues of YOU AND I. Enemy Brothers. Illus. by Henry Pitz. CLASSMATE, L(46): pp 1-3... Nov. 14, 1943 - ... C.A. Bowen, Editor. The Methodist Publishing House, 810 Broadway, Nashville, Tennessee. Enemy Brothers was published, 1943, by Longmans, Green, and Company as a book. The serial may be perused in the archives of either Drew or Emory Universities, but they require some notice. Based upon the first three pages of the serial, which are all that I have seen, there has been very little editing in the way of changes, but here and there some lines have been omitted. Pitz, who also illustrated the book, has provided a large drawing that is not in the book to introduce Chapter One, and presumably there was another drawing for each installment of the serial. I do not know in what issue of CLASSMATE the serial ended. June 14th, 1943: Enemy Brothers to be serialized (D.V.) in CLASSMATE, a boys' paper published by the Methodist Church Board of Education (U.S.A.), November, after publication. This very unusual. Readers of three motion pictures studios in New York have recommended Enemy Brothers very highly to Hollywood for production. June 14th--July 2nd: Practically completed (all but 3 or 4 pages) a shorter version of Enemy Brothers, a reduction from 78,000 words to 40,000. But the editor of CLASSMATE has made his own cuts & will not want mine. Hollywood never called Savery, and her British version of Enemy Brothers was judged 'no longer timely' when it was reviewed by the Oxford University Press that October. Up a Winding Stair. YOU AND I, 26 (#304) - 27 (#314). Feb. - Dec. 1945. Victory Press published Up a Winding Stair as a book in 1949. The British Library is the only place I know where the serial may be read, and I have not done so. The volume and issue numbers above were determined from the corresponding numbers for Rainbow Castle, below. The publisher's address and editor may be the same. In 1950, Three Houses in Beverley Road was published as a book, the first Savery title with the Lutterworth Press label, and the Lutterworth editor was involved when THE CHRISTIAN HERALD asked that two pages in their serial be changed to remain up to date. 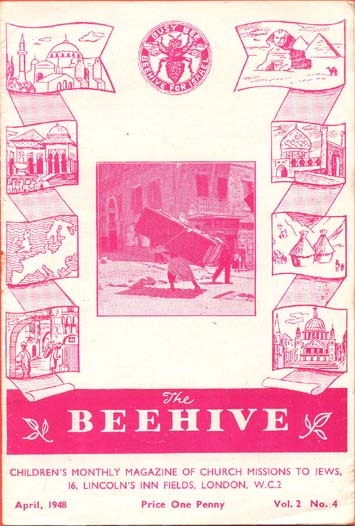 BEEHIVE was a children's magazine that also published the work of Doreen, Constance Savery's sister. Dark House on the Moss. Illus. by Vance Locke. GIRL'S TODAY, 8(2), pt. 2: pp 1-2, 5-7; pt. 3: pp 3-5; pt 4: pp 3-7; (3), pt. 1: pp 3-6; pt. 2: pp 1-2. 6-7; pt. 3: pp 5-7; pt. 4: pp 1-2, 4-5; (4), pt. 1: pp 3-6; pt. 2: pp 1-2, 5-7; pt. 3: pp 4-7. Feb. 13 - Apr. 17, 1949. C.A. Bowen, Editor. The Methodist Publishing House, 810 Broadway, Nashville, Tennessee. Longmans, Green, and Company published Dark House on the Moss as a book in 1948. The serial can be read in the GIRL'S DAY collection in the archives of either Drew or Emory University. Although the story has been somewhat abridged to accommodate the magazine, the deletions do not detract from the story. Rainbow Castle. YOU AND I, 30 (#351) - 31 (#362). Jan. - Dec. 1949. Dorothy M. Barter Snow, Editor. Hadleigh, Suffolk. During the last decade of her life, Savery gave a copy of this serial, in the form of pages cut from the magazine, to a correspondent, who lent them, in turn, to me. Used copies of the magazine are very rare, and the British Library is the only archive I know where they can be found. The author's copy indicates that the volume number was 30, and the issue numbers were #351 through #362. It is my inference that volume 30 ended with issue #360, and issues #361 - 362 are in volume 31. Rainbow Castle is a pleasant romantic story with rather conventional illustrations by an unknown artist. Cherry, a young nurse, is employed at an orphanage, where she is given a newcomer's rough time by colleagues and superiors, especially when she befriends one of the smaller children, a 'champion liar' nicknamed Puck. Working as a volunteer at the school is Dan Carstairs, a talented sculptor, who chooses Puck as his model for a statue that becomes hughly popular. By a happy coincidence, Cherry's mother had been acquainted with Dan's aunt, a member of the orphanage's Board. This gives Cherry ample opportunity to fall in love with Dan and to air her concerns about the orphanage to the aunt, creating problems for everyone. Puck has a twin sister named Peggy, who also models for Dan, creating further confusion. Once Cherry, a devout Christian, gets her personal priorities straight, the world straightens out as well, with Dan's mother in the role of deus ex machina. Puck's statue shows up later in Five Wonders for Wyn, where Dan and Cherry's marriage is confirmed. I Must Read them Again. THE METHODIST MAGAZINE, 177(1-12). Jan. - Dec. 1954. Methodist Publishing House, 4 John Wesley Road, Werrington, Petersborough PE4 6ZP. I Must Read them Again was a series of independent essays about books and authors, rather than a serial per se. Prior to perusing the bound annual given to the author by the publisher, I obtained photocopies from the John Rylands University Library in Manchester. Subsequently, the publisher granted me permission to make an additional two copies of each. THE METHODIST MAGAZINE is among the holdings of the Emory University library in the United States. Savery's titles, in order of publication, were: Izaak Walton's 'Lives', 'The Wide, Wide World', 'The Pilgrim's Progress','Uncle Tom's Cabin', 'The Lamplighter', 'Conduct and Carriage in Society', Fanny Burney's Diary, 'Little Women', The School Stories of Talbot Baines Reed, Piper of the Sea, Charlotte Yonge's Stories, and The Candle Saint: Henry Vaughan. I am, perhaps, not alone when I confess that I had previously heard of only five of the authors and had read only three of the books. It required many pleasant hours of reading before I acquired a sufficient background to write the annotations that follow these titles in the section devoted to Savery's articles. Over Moonless Seas. CROSSROAD. April - Dec. 1954, pp 16-17 or 16-18. St. Mary's Church, Becontree, Dagenham, Essex. Letters to Savery from Tom Pownell, editor of CROSSROAD, indicate that the church magazine had a circulation of about 500. Pownell paid £3 for the serial, which I had difficulty in locating. The present incumbent verified that CROSSROAD had been published by his church and a number of the old magazines had been deposited with the Valence House Museum. The museum was closed for a lengthy renovation, but an enquiry in July of 2010 resulted in a speedy response, and photocopies of the serial followed shortly thereafter. I am grateful to the Curator, Leeanne Westwood, for her courtesy in providing these uncatalogued documents. The serial episodes are short, approximately 1,000 words each, so the story has less than 10,000 words. Read continuously, the narration is direct to the point of abruptness, but I think this quality would disappear when the chapters were read at one-month intervals. Attractive Dickie Vanborough is orphaned, but she is indulged by loving and wealthy relatives who are not pleased by her decision to train for work in nursery schools. During her internship, shades of W.S. Gilbert, she finds that her real name is Olive Clarke, having been exchanged after her mother's death with another toddler. Without leaving a forwarding address, the displaced Dickie accepts an assignment in western Canada to allow the new heiress to be welcomed by her new family. Dickie is quickly loved and appreciated in her new surroundings, but she longs for England and one particular distant cousin. All ends happily, of course. Bunyan's Barn. Illus. by P.M. Carter. CRUSADE, 1955-1956. Nov. 1955, pp 24-25, 46, 48; Dec. 1955, pp ?, 46, 48; Jan. 1956, pp ?, 46, 48; Feb. 1956, pp ?, 46, 48; Mar. 1956, pp 24-25, 46, 48. Evangelical Alliance, 30 Bedford Place, London W.C.1. The Evangelical Alliance is alive and well, although it has moved from Bedford Place. They maintain an informative web site at www.eauk.org and were kind enough to send me photocopies of Bunyan's Barn to use in preparing this bibliography. They would probably do the same for others in return for a modest contribution. Here is a review of the serial from Savery's correspondence. The incident is repeated in the fair copy of her work diary in substantially the same words. In family circles Savery was usually addressed as Winifred. "Did I ever tell you what happened to me long, long ago, when I went to a friend's house for tea with my sister Phyllis? Trying to make conversation, our host said to her, 'I see that your sister has a serial in Crusade. 'Oh yes,' said Phyllis in a ringing voice heard by all the other guests at the table. 'THAT IS WINIFRED AT HER WORST!' The host made a gallant but not precisely tactful attempt to remedy the situation. 'Do you think so?' he said feebly. 'I've only read one chapter.' The blushing authoress retired behind her tea-cup. She had been quite proud of that serial!" A story for an evangelical publisher must have a strong evangelical emphasis, and that is true of Bunyan's Barn. When Mary Dawson inherits a cottage of that name in Deepwell Green, she looks forward to an idyllic retirement in a rural beauty remembered from childhood. Unfortunately, the years have not been kind to Deepwell Green, now an industrial suburb, and the 'barn,' where John Bunyan once preached, is a government repository for mattresses and coffins. Mary's neighbors are unsympathetic, and there is a home for 'rough children' next door on one side presided over by Miss Cobb, a martinet with no use for the Christianity that sustains Mary. Besides Mary and Miss Cobb, other excellently drawn neighbors include the raucous children at the orphanage and sullen Tony who is 'living on' his sour mother next door on the other side. Although I recommend the first nine chapters to Christian readers, the book is too short to accommodate in a credible way the series of events that follow. Were it possible, the Holy Spirit would have been quite exhausted by the marvelous events that unfold one after another in the tenth and final chapter. Lovers of Bunyan will appreciate repeated references to his works and characters. The Attic Bookshelf. THE METHODIST MAGAZINE, 179(1-12). Jan. - Dec. 1956. Methodist Publishing House, 4 John Wesley Road, Werrington, Petersborough PE4 6ZP. Like I Must Read them Again, above, this is a series of essays rather than a story, and the John Rylands University Library in Manchester provided me with photocopies at a nominal cost. The individual titles, one for each month, were Dearest Mrs. Delaney, Charles Writes His Life, Laurels Not Wholly Faded, Some Small Pink Books, Sara Coleridge, The Novels of Ellen Thorneycroft Fowler, Indian ALOE, Cornish Storyland, The White Cross and the Dove of Pearls, In the Golden Dawn, A Rose-Coloured Performance, and Letters of James Smetham. These titles are annotated individually in the section devoted to Savery's articles. The White Cross and the Dove of Peace was read and reread by Savery's grandmother, and that generation would have found many favorites among Savery's choices. Alas, I did not know the authors and had read almost none of their books, save that one essay mentioned twenty-four different 'rather bad books' of which I had encountered five. I am grateful to Savery for the introduction to many of these authors, especially Smetham. It did take me more than a year to find a book by Mary Anne Schimmel Penninck, in part because she was published under the name Schimmelpenninck. Savery submitted a manuscript based upon I Must Read them Again and The Attic Bookshelf to Allen & Unwin in 1965, but they did not choose to publish it. There is a "reader's report" recommending rejection in the manuscript collection at the University of Reading library. To the City of Gold. London: THE CHRISTIAN HERALD, "Christian Herald" Co., Ltd., 6, Tudor Street, London. July, 1959. Printed by W. Speaight & Sons, Ltd., 98 & 99, Fetter Lane, London E.C.4. The work diaries provided the title and journal name. The story is not in the 'American CHRISTIAN HERALD.' I have not seen the appropriate issue of the 'English CHRISTIAN HERALD,' and the addresses above are from a 1938 issue. To the City of Gold was published as a book by Lutterworth Press in 1958. The Boy from Brittany. London: OUR OWN MAGAZINE, 80. 1959. Children's Special Service Mission (C.S.S.M.) and the Scripture Union, 5, Wigmore St., London, W.I. I have seen neither the serial nor any contemporary issue of the magazine in which it appeared. The data about the publisher, above, is taken from a 1958 issue. The serial is mentioned in Winifred's Thought Book. The Boy from Brittany was published previously as a book by Pickering & Inglis in 1957. Savonarola's Children. Nashville: FIVE / SIX. 1968. American Methodist Church Board of Education, Graded Press, Nashville, Tennessee. The Lutterworth Press published an expanded version of this serial in a book entitled The City of Flowers in 1970. The information about the serial was taken from a letter to Savery from the publisher. Persons seeking copies of the periodical should be aware that the title was printed on the cover with "Five" on one line and "Six" on the line below, so the title is variously spaced and punctuated: e.g. : FIVE : SIX, FIVE / SIX, FIVE | SIX, etc. There are copies of the periodical in the libraries at Emory and Drew Universities. This web site © 2010-2014 by Eric Schonblom. Updated 29 May, 2014. The unpublished works of Constance Savery are reproduced with the permission of the copyright owner, J. D. Hummerstone.